Whether you have a single office building with multiple tenants, a campus complex of several buildings or a large commercial park with central management, we can provide networked security solutions to meet your needs. At Ojo Technology we have experience working with a number of commercial customers including AT&T, Juniper Networks, McClellan Business Park, Yotel San Francisco, SIMS Metal Management and Safeway. Our projects also include retail shopping centers such as Southland Mall, Bay Street Shopping Center, Hillsdale Shopping Center and Madison Bay Fair Mall. And we have serviced cultural and family attractions such as the San Francisco Ballet, Oakland Museum of California, Asian Art Museum and the Santa Cruz Boardwalk. For single office buildings and corporate campuses, we work with IT and internal security departments to provide indoor and outdoor coverage including entrances, hallways, work spaces, storage areas, delivery bays and parking lots. Cameras are connected to the company’s network and can be managed from a central monitoring location or from multiple locations, including offsite through portable devices such as laptops and mobile phones. 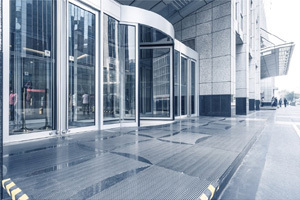 In addition to video surveillance, we can also provide integrated access control solutions, intrusion detection systems, PA and intercom systems, emergency blue-light phones and lobby badge-in systems through our network of technology partners. For large commercial parks, Ojo Technology has developed a unique, collaborative approach. We can design integrated, Internet-accessible systems to provide both perimeter surveillance for strategic common areas that are centrally managed as well as restricted, localized surveillance for specific properties or tenants. This system is scalable and can be reconfigured at any time. And remote areas can be added to the perimeter system via wireless installations. There is no limit to the number of servers, cameras and clients that can be added.